Today we are proud to announce the release of our brand new groundbreaking product! Meet SEMrush’s Organic Traffic Insights, which helps you better understand what’s happening on your website and improve your SEO strategy with statistics on real visitors' traffic. Tired of planning your SEO activities without knowing which keywords bring users to your site? The ’Landing Pages/Keywords’ report available via our new tool will help you to uncover a majority of your website’s withheld (‘not provided') keywords, and see the actual amount of organic traffic driven to your website for each of them. The ’Landing Pages/Keywords’ report includes all the most important acquisition, behavior and conversion data for your site’s first 30 landing pages. All this data is taken from your Google Analytics account. Now you can see a list of organic keywords that lead to a certain landing page. 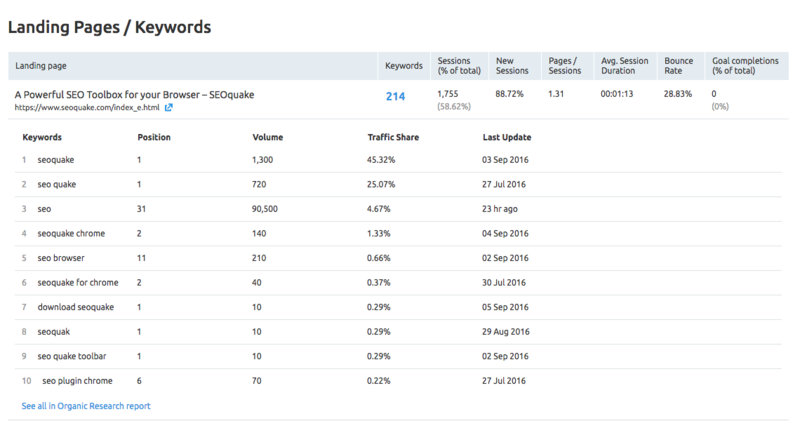 This report also includes such keyword metrics as ‘Traffic Share’, ‘Volume’, and ‘Position’ – all data is taken from SEMrush services. With the Organic Traffic Insights you can monitor how your traffic and rankings rise over time so you can analyze and measure your SEO efforts. At the top of the tool’s interface, there’s a handy dashboard that shows the main metrics and trends for your site (the Organic Search Traffic Channel). With the SEMrush Projects dashboard you can monitor all of your Google Analytics accounts. To get started, go to SEMrush Projects. If you already have at least one active Project running, you'll notice a new section there called 'Google Analytics Tool.’ Go ahead and click the 'Set up' button and follow the wizard’s instructions.